Développement – To Linux and beyond ! My collaboration with OISF has been announced today. This is an honor for me to join this excellent team on this wonderful project. I’ve taken a lot of pleasure in the past months contributing to the project and I’m sure the start of an official collaboration will lead to good things. The challenge is high and I will do my best to merit the trust. A big thanks to all people who congrat me for this nomination. Suricata 1.1beta2 has brought OpenBSD to the list of supported operating system. I’m a total newbie to OpenBSD so excuse me for the lack of respect of OpenBSD standards and usages in this documentation. Here’s the different step, I’ve used to finalize the port starting from a fresh install of OpenBSD. Autoconf 2.61 is know to work, some other versions triggers a compilation failure. You can now run make and make install to build and install suricata. Following my preceding post on suricata multithread performance I’ve decided to continue to work on the subject. By using perf-tool, I found out that when the number of detect threads was increasing, more and more time was used in a spin lock. One of the possible explanation is that the default running mode for pcap file (RunModeFilePcapAuto) is not optimal. The only decode thread take some time to treat the packets and he is not fast enough to send data to the multiple detect threads. This is triggering a lot of wait and a CPU usage increase. Following a discussion with Victor Julien, I decide to give a try to an alternate run mode for working on pcap file, RunModeFilePcapAutoFp. The architecture of this run mode is different. A thread is in charge of the reading of the file and the treatment of packets is done in a pool of threads (from decode to output). The augmentation of the power of decoding and the limitation of the ratio decode/detect would possibly bring some scalability. The performance difference is really interesting. The FP mode shows a increase of the performance with the number of threads. This is far better than the Auto run mode where performance decrease with the number of threads. 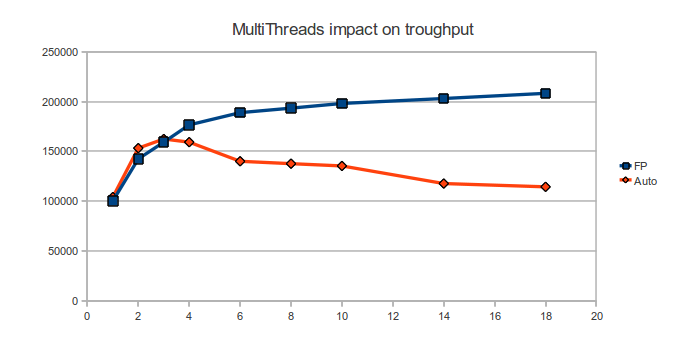 As pointed out in a discussion on the OISF-users mailing list, multithread tuning has a real impact on performance. 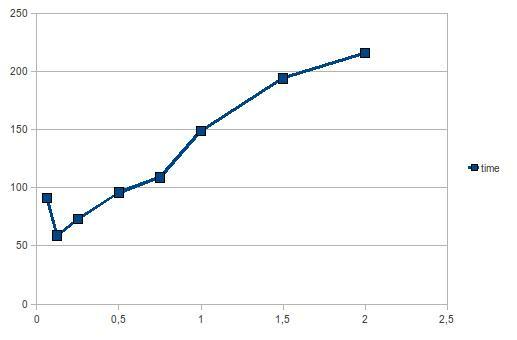 The result of the tests I’ve done are significant but they only apply to the parsing of a big pcap file. You will have to tune Suricata to see how to take the best of it on your system. La journée utilisateurs du Netfilter Workshop aura lieu à Paris le 29 septembre 2008. Cette journée prendra la forme d’une série de conférences sur Netfilter. Les sujets seront variés allant de la description de l’utilisation de Netfilter chez un ISP dannois à la présentation par David Miller (maiteneur de la couche réseau de Linux) ou Patrick McHardy (Leader du projet Netfilter) de leurs derniers développements. Je donnerai d’ailleurs lors de cette journée une conférence sur ulogd2, la nouvelle infrastructure de journalisation de Netfilter. L’événement aura lieu dans les locaux de l’ESIEA dans le 13ème arrondissement de Paris. L’accès est libre et une inscription est demandée.